When I was writing my newest book, Learn to Hand Sew for Mini Dolls, I created several patterns that I could not use in the book. Some of the patterns were not easy enough for the book. Some of the patterns could not be made with knits and I had decided that all the clothing should be made from knit fabric. My favorite pattern that did not make the book is this ballet costume. 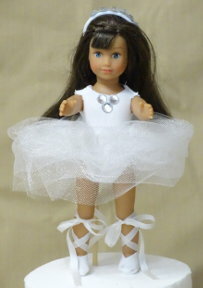 The little tutu is made from tulle and is too difficult for a beginner. Here is a picture of a second, easier version of the tutu. 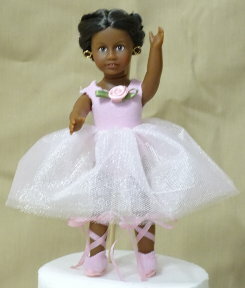 The free instructions include both versions of the tutu. Neither version is difficult for an experienced sewer, but I don’t think that a beginner should try either version. The leotard is difficult to cut out, but once it is cut out I think that a beginner can sew it with needle and thread. An experienced sewer can make this whole costume or let a beginner help complete the easy parts. I am giving this pattern away because I think it is too cute not to publish and I don’t have a place for it in any of my books right now. If you like the pattern, I hope that you look at my books, Sewing for Mini Dolls, which is for intermediate sewers and Learn to Hand Sew for Mini Dolls, which is for beginners. You might find a use for one or both or the books. Click here for free ballet pattern 2.